This is an updated version of a news item published on 21st April 2010. This fantastically useful and free book has now been downloaded 12,972 13,068 times, and that only tells part of the story. Others have made it available on their own websites, and I obviously cannot know how many downloads they've enjoyed. Also, some people have passed it on to many others. Going by the poll I set up, the 40 people who have responded so far sent it out to an average of 77 people each, which if true of everyone would mean that over a million people have seen it so far. It's rather too small a sample to draw such conclusions though, and that mean figure hides a wide range. UNESCO, for example, has sent information about to to 5,000 people as well as placing a note about it on their website. If you like, you can access the contents of the book in three other ways, and even embed it on your own website. Firstly, there is a SlideShare option. The links are live, ie you can click on them and they work. Also, the subject-project list near the beginning of the book now contains hyperlinks to the projects cited. You’ll see the embed code near the top right-hand side of the screen. Thirdly, there is now a Scribd version. This, too, can be embedded in a web page or blog post, and shared over social networks. This ebook has now been downloaded at least 10,056 times. Why the lack of precision? Because lots of people Over 10,000 downloads in less than 3 weeks! Woo hoo!have put it on their own websites or VLEs, and obviously I can't track the downloads from 3rd party sites. Also, some folk have linked directly to the file on my site -- in which case I still can't track the number of downloads. Much better to link to the download page, and let people click the link there. 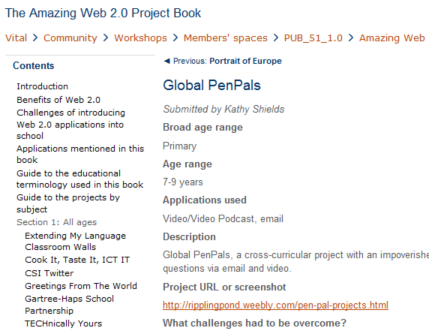 In case you've missed it, the book contains details of 87 projects involving Web 2.0 applications in the classroom. It's methodical, inspirational, fun, moving (to quote Gerald Haigh) and free! Go to the download page just mentioned to find out what others have said about the book and, erm, download it! Free Web 2.0 Projects Book Now Available! At last! 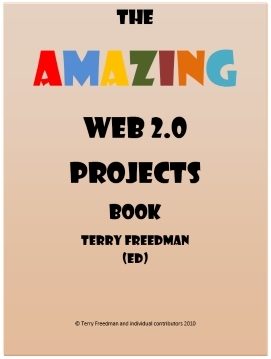 The Amazing Web 2.0 Projects Book! And did I mention that this is free?! To download it now, and to pick up a badge you can use to promote it (if you want to), please go to the Free Stuff page. I should have mentioned this in the main article, but if you would like to let other people in your Personal Learning Network (PLN) know about this resource, there is an effortless way to do so. Just click on the link, at the bottom of the article, that reads 'Share this', and a pop-up window will appear containing links to Twitter and a gazillion other networks! Web 2.0 For Rookies: What Is Microblogging? In this series I explain in plain and simple terms what various web 2.0 concepts and applications are. Items covered so far are Web 2.0 itself and blogs. 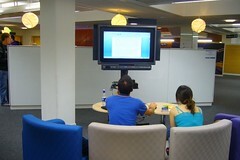 This time, microblogs are under the microscope. Microblogging is a form of blogging in which the length of each post is limited to a certain number of characters. Usually this is set at 140, but in some cases it is 160, the same as sms (text) messages. So what can you use this sort of thing for? In other words, what's the point? The best-known of these services is, probably, Twitter. To some extent, and certainly at first, its value was doubtful because, believe it or not, nobody really cares what you had for breakfast or that you're going to watch Neighbours. But there are more serious uses. For example, teacher Chris Leach used Twitter to help his class of primary (elementary) school children understand the Gunpowder Plot, as you can read in the Web 2.0 Projects Book (2nd Edition) -- look out for that in the Free Stuff area of this website -- and in this summary. Another popular use is as a means of recording what a speaker at a conference is saying, which can be especially useful to colleagues who were unable to attend. It can also be used as what is called a 'back channel', which is a conversation between members of the audience about what the speaker is saying. Sometimes this can be quite useful, with people dropping in useful links and their own insights. You could also use it in lessons, such as asking the students to have a meaningful debate through Twitter, or to write film of book reviews. It sounds impossible, but in fact the 140 character limit really focuses the mind and forces you to cut out excess verbiage. It also encourages 'sms-speak', which some educators do not approve of. 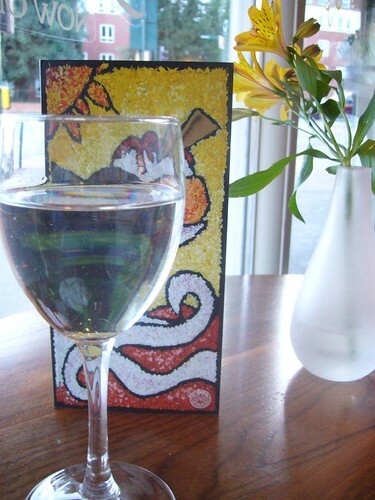 One of the most common uses of Twitter is to pass on information about useful resources. Indeed, I regard this as essential to my attempts to keep up with all the developments in education and educational technology. As part of this dissemination process, some people (including myself) use Twitter to announce the posting of new articles on their blog. You can use a service like Twitterfeed to automate this through the use of your blog's RSS feed .A school could use this facility to let parents know when something new has appeared on the school website. For this to work, you'd have to set up a Twitter account for the school, and then try to encourage parents to sign up to Twitter and then 'follow' the school. Topics of interest can be assigned a hashtag, eg #myconf. By entering the hashtag, 'tweeters' can help to ensure that their post will be picked up by anyone keeping track of that hashtag. Twitter also has a list facility, which enables you to join or create lists of people in Twitter whom you'd like to 'follow': following someone means that you are more likely to see their messages than if you weren't following them. Twitter is not the only game in town as far as microblogging is concerned. There are two others which are especially suited to education, these being Edmodo and Cirip. Each of these allows you to create groups, which can be very useful, and its worth exploring their features to see which one is right for you. or example, Edmodo allows you to upload files, whilst cirip lets you include pictures and even video clips in your posts, and to create or join private groups. Don't let the fact that it's Romanian put you off: there's an English version of the website. ave a look at José Picardo's article on Edmodo, and the related articles he lists at the bottom of the page. A moment ago I mentioned reviews. There's a service called Blippr which is specifically set up to enable you to review books, music and films in 160 characters. Moreover, it incorporates elements of social networking because you can easily see and interact with others who have reviewed the same thing. Obviously, though, this has implications for e-safety, as does any kind of open online space. The same applies to the similarly-named Blip, which lets you create playlists of music tracks, which you can also review, and connecxt with others who share your taste in music. One last thing: the groups facility in Edmodo and Cirip could be used in the service of admin. I think if I were still a Head of Department I would seriously consider setting up a group for my team, to enable us to quickly and easily exchange notes, news, links and other resources. Carmen Holotescu, who first told me about Cirip (a fact I forgot to mention in the article) has told me about these further articles about microblogging. 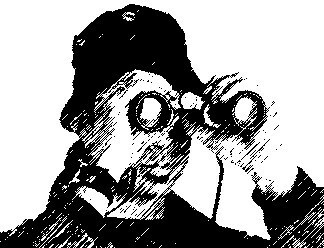 Here is a thumbnail sketch of some interesting work that Chris Leach is doing with Web 2.0. It is taken from the forthcoming second edition of the free Web 2.0 projects Book which was published last year -- over 11,000 copies downloaded! The book itself will contain even more information, so look out for that early in 2010! Creating a twitter account for Robert catesby, leader of the Gunpowder Plot. Children researched the events after Fawkes's capture and then scheduled tweets using Hootsuite. He gained over 60 followers. Chris Leach has informed me that the project has received feedback. This in itself is worth looking at, not least ebcause it demonstrates a great use of WallWisher, a sort of online post-it note application. Here is a thumbnail sketch of some interesting work that Silvia Tolisano is doing with Web 2.0. It is taken from the forthcoming second edition of the free Web 2.0 projects Book which was published last year -- over 11,000 copies downloaded! The book itself will contain even more information, so look out for that early in 2010! 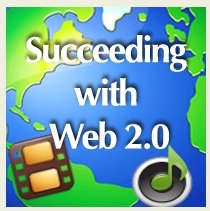 Here is a thumbnail sketch of some interesting work that Damian Maher is doing with Web 2.0. It is taken from the forthcoming second edition of the free Web 2.0 projects Book which was published last year -- over 11,000 copies downloaded! The book itself will contain even more information, so look out for that early in 2010! Application type: Using Google maps to support an excursion. Here’s a thumbnail sketch of some interesting work that Kim Munoz is doing with Web 2.0. It is taken from the forthcoming second edition of the free Web 2.0 projects Book which was published last year -- over 11,000 copies downloaded! The book itself will contain even more information, so look out for that early in 2010! Here’s a thumbnail sketch of some interesting work that Dorothy Burt is doing with Web 2.0. It is taken from the forthcoming second edition of the free Web 2.0 projects Book which was published last year -- over 11,000 copies downloaded! The book itself will contain even more information, so look out for that early in 2010!